It reads, A in Mathematics, B in English, B in Science and so on, but this year you’ve received an extra score from the all-seeing assistant – the “smart eye”. Using cameras and the latest artificial intelligence software, this robotic assistant has been tracking the behaviour of you and your classmates. Your facial expressions were regularly examined and grouped into one of seven emotions: happiness, sadness, anger, fear, disgust, surprise and neutrality. If you fell asleep, raised your hand or stood up, the system was aware. All this information appears on your report card and is shown to your parents. For students of a middle school in Hangzhou, China, this has become a part of everyday life, but for what benefit, and at what expense? Critics are speaking out in large numbers, but the consequences of the system are still unclear. So, what about the intentions? Is the system being used to better the lives of the students? The schools vice principal says yes. “It can improve interactions between the teachers and students” he said when asked by thepaper.cn, a Chinese news outlet. The system is designed to monitor the students with more consistency and efficiency than a human assistant ever could. No child is ignored or ‘lost’ amongst the group. If a child has a problem or is causing problems, the teacher will be informed and can take action accordingly, whether it was directly witnessed by them or not. The system is used, not as a replacement of teachers, but as an aid for teachers. The intention is to provide extra eyes and to catch things that even the best teacher may miss. It should be noted that no video or image recording takes place; only data is saved. For example, a sleepy student may be identified and labelled A and an alert student identified and labelled B, but the actual footage would not be recorded in the database. It can be said that in order to develop and improve, one must first become aware of their faults. Students of the school receive a detailed analysis of their behaviour in the classroom that, if accurate, can form the basis of effective steps of self-improvement. One student said “it encourages us to behave well”. In a sense, the teachers are simply providing personalised data to structure growth. But is the intention truly centred on benefiting students? Or are they intentionally instilling fear into the pupils, in order to gain control and allow operations to run smoother for those in charge? Is the wellbeing of the children considered more important than the school’s academic achievements? “I don’t dare be distracted after the cameras were installed in the classrooms. It’s like a pair of mystery eyes are constantly watching me”, said one student to Hangzhou.com. This opinion must already be apparent to the school, yet they have still decided to go ahead and implement the system throughout the school. Does this suggest that some greater factor exists that morally outweighs student discomfort? Or does some other factor exist that is deemed to outweigh moral factors all together? A school often has great pressure to achieve and maintain good results. The government, parents and the wider community all rely on the success of the school. Are the long term effects on the students being pushed aside in order to allow targets to be hit? Human rights group and NGOs see the increasing emotional surveillance in China, as part of a widening control regime that applies inescapable pressures on its residence to conform. As the most vulnerable and impressionable members of society, the children may be amongst the weakest to the forces of this alleged agenda. Prosperity or depression – what follows? So, what about the possible outcomes and consequences? Will the children bring more success and prosperity to their families in the future? Or will they be shaped to remain comfortably confined to conformity for the rest of their adult lives? Consider the possibility that the disciplined students could have greater academic success as a result of the controversial system. They could attend more prestigious universities, pursue more successful careers and contribute more to the wider society, all while improving the livelihood of their immediate families through stable income. Does this out-balance the increased anxiety throughout the school years? In fact, many parents have already long believed that, with respect to schooling, their child’s short term struggles will bring the most good to the family and to the child’s future. For the most part, this comes from love and is therefore a generally accepted approach worldwide. If the intentions of the school truly are like that of a caring parent, then of course they want the most success for the most students possible, even at the expense of short term hardship. Perhaps they want all pupils to behave how only the ‘best’ students usually do, in order to create a level behavioural playing field, to allow more to rise-up academically; for more to succeed. But does the system even work? How many children will genuinely change and how many will learn to act? Experts say that it is “an incredibly dangerous precedent” to determine one’s behaviour based on emotion or facial movements. Many students resort to fakery and pretend to be very focused, even if they are in fact not engaged in the slightest. Some well-established ethical standpoints state that something is morally just if the outcomes produce the greatest good for the greatest number of people – namely utilitarianism. In this instance, it can be said that, if successful, the system can benefit the greatest number in terms of prosperity and financial stability. But at what emotional expense? What if the results are poor and the suffering remains? What if the system wrongly analyses the complex emotions that children exhibit? Will a depressed child be punished? Will a child’s negative feelings be perpetuated? Before deciding if the system benefits the majority, you must first decide where to draw your circle. If around the school’s pupils, you will likely decide that this system does not benefit the majority; if around the children’s families and economic sectors, perhaps you would think otherwise. Based on the above, the initial stand point is against the system. Very interesting! I think this could be a very useful tool but has been horribly misused already, as this seems very damaging to the children. Maybe if there were laws to prevent storage of the data for longer than a certain amount of time, teachers could use the camera responsibly to aid teaching. I think that it is good that at least no actual footage is stored! 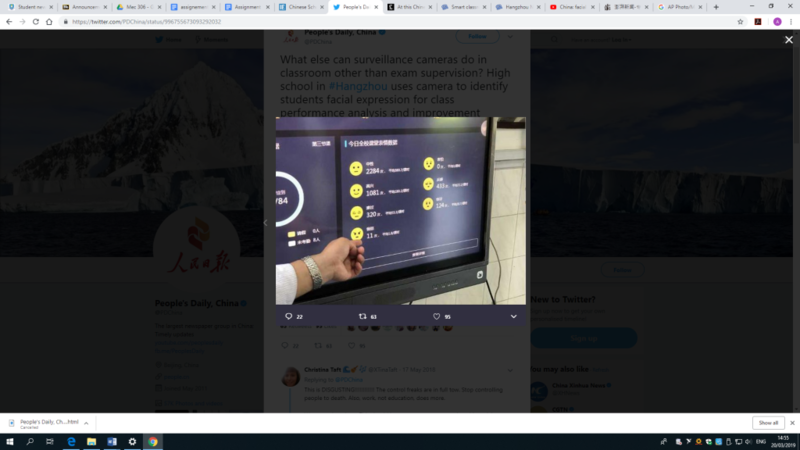 I think at face value this is a concept that would help certain individuals in the school environment, but it could have many negative impacts on other students that have not been discovered yet. It may even result in more children becoming anxious and scared of going to school, knowing they are being monitored. It is a dangerous precedent to begin to monitor their emotional behaviour and could have unforeseen issues in the future. Maybe this could be trialled with non school children in a controlled environment at first, before it is widely used in schools? Although the system has been created with a good intension of improving the academic ability of its students, I think the faults outweigh its potential benefits. The schooling system is not fit for every student, yet every child is expected to attend school. I think that it has the ability to segregate those individuals further or force them to be academic when their strengths may lie elsewhere. The pressure of high achievement in school causes enough stress on students, and monitoring their behaviour and participation is not only a breach of privacy but will induce anxiety unnecessarily. Does the system account for a bad day? I think it is a superficial way of monitoring pupils, and is likely to deter student from enjoying school. I wonder what this system would have made of Paul Dirac who often appeared asleep in lectures but had closed his eyes to listen to what was being said. There’s a lot of discussion about the system, and it’s pluses and minuses but I don’t see a lot of ethical discussion. Can you expand on that please.